*LaLaLa ymcg crafting*: Stampin' Up New Catalogue! & Want Free Stamp Sets? Stampin' Up New Catalogue! & Want Free Stamp Sets? 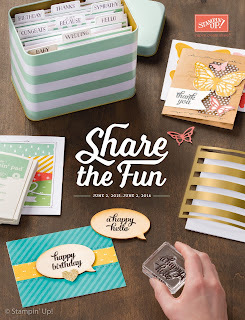 2015 - 2016 Stampin' Up New Catalogue & Earn TWO Free Stamp Sets in June! The new 2015-2016 Stampin’ Up! Annual Catalogue is live and you can officially order products from today! If you would like to order through me, you can click HERE to visit my on-line store and don't forget use Hostess code FZRK9HS2 to receive special gift from me! Join 2 June - 30 June! Starter Kit is $189 and choose up to $285 in product PLUS you get two more stamp sets of your choice from the new catalogue!